It started out with breakfast. Pancakes, eggs, sausage. Pretty ho-hum, actually, until I found the waffles makers. Just like Hampton Inn, y'all. Dump your batter in and wait for the beep. I do love those waffles. Michele believes this breakfast is superior to Hampton. I guess she's probably right, but the waffles are the same...and the waffles are all I care about. And the kids. I care about the kids. So after I ate my waffles I took some pictures of them. Note the boys cleaned up their table. I checked them for fever. After breakfast (and some time for it to settle) we went swimming. They. They went swimming. You'll notice this picture is outside. The temperature at the time of this photo is 39 degrees. The pool here is heated and is half inside/half outside, so the coldest person pictured is Sally, who took one for the team to stand outside so the kids could be out there. I reentered the building approximately 4 seconds after taking this picture. Then it was time to get down to business. The kids put on their choir shirts, and we gathered in the lobby to get ready to head to our first concert. Here's Michele giving them a pep talk. En route to the concert, we passed this place where my sister-in-law used to work when they lived in Nashville. So I dropped the kids off and swung back, parked across the street, and snapped the picture. Now that I think about it, that was a little odd. You don't care about this. Skip this picture. In fact, skip this whole paragraph. It's lame. We arrived at our first concert venue: Morningside of Franklin. I was a little worried at first because I noticed they had one of those plastic postal bins on the ground out in front by the mailbox. I said a little prayer that they were using it for official purposes. I'd hate to have to turn them in to Cliff Claven. Fortunately when this postal-person arrived, he picked up the bin. Crisis averted. The concert went well. So much fun to watch the kids sing...and to watch the residents enjoy listening to them. And a HUGE HUGE THANKS to Helen for coming along to play the piano with us! She deserves hazard pay for what she has had to deal with. These are really more "fun machines" than pianos. Either out of tune or moderately dysfunctional frequently. The second one was electric with one note that always played as loud as possible. She just worked right through it. The music is great (including a sing-along I'll tell you about in a minute), but this is the best part here...our kids reaching out to the residents and making connections with them. They are very good at it, introducing themselves, thanking the residents for coming to the concert, and then listening patiently if the residents start talking. This is truly heartwarming. I hope the kids one day understand what a difference this kind of interaction makes. A little time on the porch of Morningside before we boarded the buses and headed to lunch. We had lunch at Five Guys. It was tasty, though I'm not sure I'm ready to go quite as far as The Journal, DE, who apparently had a euphoric experience (as evidenced by the quote on the wall). In fact, I'm not sure a burger has ever led me to a euphoric experience. Some people are just really into food, I guess. After lunch we headed to our second venue of the day, the Hearth at Franklin. Here we sang two concerts: one in the assisted living area and the other in the memory care unit. As we pulled into the parking lot we were surprised by some former Decatur friends! This picture is my van crew (we've decided to call ourselves the Pandas and have, for the moment, dubbed the van "The Panda Express") along with Patsy and Susan, who came to see us after reading the blog yesterday. So great to see them! The concert started like any other concert. Can I just say that this selfie is a true, old-school selfie. I'm using an old camera which did not allow me to see what the picture was going to look like. No, no. It was just a very cool aquarium wall. But that gave me an idea! They're never going to let me have the camera again, are they? This, y'all. This is love. At our second concert, Michele was glowing. No, really. She was glowing. I took a video of the penultimate song. This is the cutest thing. Audience participation and everything. The residents love it. The kids love it. So much fun! Ok, Michele. Say what you want about breakfast. I noticed THIS when we got back to the hotel. Really? How can any self-respecting choir from Atlanta stay at a hotel that has sold out to Pepsi?! I would like to lodge a complaint. After I recovered from the shock of seeing a Pepsi fountain downstairs, and after we changed, we headed out to Opry Mills Mall to have dinner at the Rainforest Cafe. Great food and a lot of fun. We sat near the gorillas, who every now and then would make gorilla-y noises, usually after I told a joke. I'm not sure if they were laughing or expressing a deep desire for me to stop telling jokes. Most likely the latter. 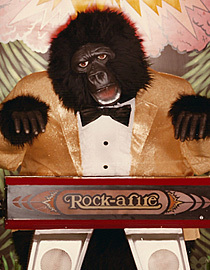 Either way, I commented to Brian that these animatronic gorillas took me back to Showbiz pizza. He said, "Oh, right with the band. That was a long time ago." Ouch, Brian. But look at the pictures below...you can see it, right? After dinner we came back and played some games. You had to get people to say the word(s) you were given by describing them without saying them. When someone got the words you were saying, you won gummy bears. Or oreos. A chocolate oreo. Chocolate cookie. Yum, yum, yum. I noticed an interesting juxtaposition on the Friends of DFUMC Facebook page today. Sharon shared a post David had written highlighting historically significant Methodists and how they served the world around them. From John Wesley to Jackie Robinson, it is an impressive gathering of people who made a profound difference in the lives of the people they touched. Just below that post, my first blog post from yesterday. We may not have the name recognition of Rosa Parks or Harriet Tubman, but when we step into the world around us and extend our hands to others, we too make a difference. To be Christian, to pattern our lives after Christ, is to love others. It is to reach beyond our comfort and be Christ for the world. After all, if Christ is to embrace the lonely or the sick, how will he do it if not with our arms? Would you have had the courage? The kids in Hosanna Choir did. I sure am proud of them. All of them. And finally tonight (on the lighter side), a new feature in the Music Mission blog that I hope will become a regular feature: Caption That Photo. You can leave your caption in the comments on the blog or on a post in facebook. Best comment for the picture wins gummy bears and chocolate oreos. Good luck. Caption: "One more time and you have to sit with Ms. Lynn!"